In the 32 Counties of Ireland-Fermanagh is dominated by two lakes called Upper and Lower Lough Erne making it one of the most popular counties for cruising. This is one of the north western northern Irish counties. 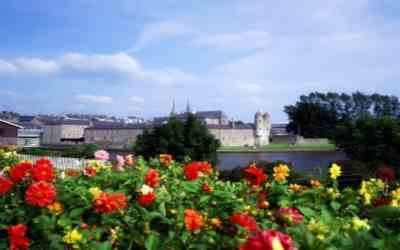 Regarding things to do in Ireland, County Fermanagh has many tourist attractions if you are planning a trip to Ireland . There is the worldwide Belleek China brand and local sights such as the Marble Arch caves. See below for tips on places to visit if you are planning any Ireland tours. It is situated just 1 hour and 30 minutes from Belfast and 2 hours from Dublin. It has a population approaching 60,000 people and the main town is Enniskillen. County Fermanagh has a well-known tourist attraction in the Marble Arch Caves. 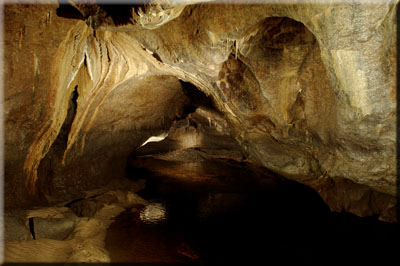 The Marble Arch Caves are composed of limestone. They are part of a large cave system and were opened to the public in 1985. It is possible to tour them by boat or on foot. County Fermanagh is sometimes referred to as Northern Ireland's Lake District.The two main lakes are called Upper and Lower Lough Erne. The lakes are a tourist attraction with spectacular scenery, water sports and fishing. Both Famous poet Oscar Wilde and Samuel Beckett were born in Enniskillen and educated at Portora Royal School. 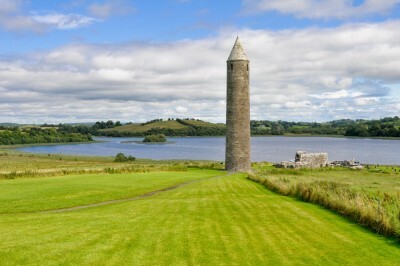 Devenish Island is the site of a twelfth century round tower. The tower is 100ft tall and can be climbed by internal ladders. When the National Trust bought Castle Coole in the 1950s, the Earl of Belmont left his furniture and everything else inside. He still owns it, but you may see a "great house" as it would have been in the old days. Monea Castle is a splendid example of the so-called plantation castles built by settlers. If you are interested in castles, it will be well worth your time to head for Monea. The famous waterways are extensively used for lakeland boating and cruising holidays making County Fermanagh in Ireland one of the premier destinations for a cruising holiday and also a haven for anglers from all over the world. The river begins by flowing north, and then curves west into the Atlantic. The southern lake is further up the river and so is named Upper Lough Erne. The northern lake is Lower Lough Erne. The town of Enniskillen lies on the short stretch of the river between the lakes. The lakeside is high and rocky in some parts and, in addition to the 154 islands, there are many coves and inlets. When windy, navigation on Lower Lough Erne, running for 26 miles almost to the Atlantic Ocean, can be something of a challenge with waves of open-sea dimensions! Shallow Upper Lough Erne, spreading southeast of Enniskillen for about 12 miles, is a maze of islands. 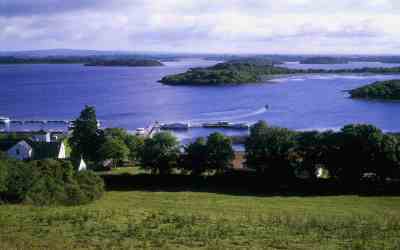 Lough Erne is a particularly scenic waterway, renowned for its beautiful setting. The area is really popular for fishing, watersports, lakeland boating. The stretch of water alongside the Broadmeadow, Enniskillen, has hosted stages of the World Waterski Championships and canoeing is also a popular recreational sport on Lough Erne. On the outskirts of Enniskillen, stands Castlecoole, one of the treasures of the National Trust. This magnificent neo-classical house took ten years to build and was completed in 1798. 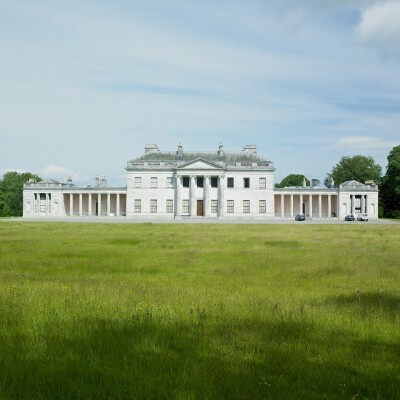 The surrounding 700 acre estate is a fitting setting for the house, with parkland, Lough Coole and extensive woods. Visitors may enjoy walks in the grounds and also see the Grand Yard, the Servants’ Tunnel, laundry house and display room. Established in 1857 Belleek Pottery makers of Belleek China in County Fermanagh Ireland situated approximately 25 miles from Enniskillen holds a very special place in the cultural and commercial heritage of County Fermanagh Ireland. Nestling on the banks of the River Erne this imposing building is home to the world famous Belleek Fine Parian china one of Irelands oldest and most fascinating visitor attractions. Various Belleek marks have been used by Belleek over the years since the pottery was founded in 1857. One of the earliest Belleek Marks was a circular band with the wording 'Belleek Enniskillen'. This was followed by the more familiar combined Wolfhound Harp and Roundtower and have been the core features of the factory logo ever since. The most latest Belleek Marks version that was introduced in January 2011 had its web-site address included. Most collected and prized pieces include the early Black Mark range. No two pieces of Belleek Pottery are ever the same and they are made using techniques handed down from generation to generation. Visitors can take a guided tour through the factory, visit the museum and audio visual theatre and also have the chance to purchase authentic Belleek pottery gifts in the gift shop, before having something to eat in the on site restaurant, served on authentic Belleek Pottery produce . Collectors divide Antique Belleek pottery into a number of distinct periods. The first covers the years 1863-1890, and the second 1891-1926. Pieces from these early periods are generally the most sought after and therefore the most expensive. Shell form vases and centerpieces and tableware painted with Belleek’s trademark shamrock design are highly collectable today as antique Belleek. 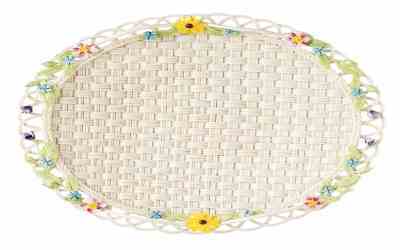 Basketwork wares with three strands can fetch up to £3,000 or more. Alternatively, an antique belleek shamrock cup and saucer set from the 1960s might cost as little as £30 . Sales of ceramics or decorative arts at any large auction house will often include a few pieces of antique Belleek. Here you can take a walk around the Studios, Galleries, Shops and Coffee Shop of the Buttermarket Courtyard, one of Ireland’s premier craft centres, located in the heart of Enniskillen. Soak up the relaxed atmosphere and purchase some of the best art and craft products, all of which have been made in Fermanagh. The early 19th century Buttermarket buildings have been beautifully restored, and house such diverse crafts as pottery, fly-tying, ceramics, handmade jewellery, textiles, picture framing and original art. The turrets of the 17th century Watergate at Enniskillen Castle provide an iconic image of Enniskillen Town. Nestled amid Fermanagh’s Lakelands on the banks of the picturesque River Erne you will find Enniskillen Castle. This fine castle represents an important part of Fermanagh Ireland rich history and heritage. Enniskillen Castle presents an array of 19th century barracks buildings surrounding the Medieval Castle Keep; to the south with its distinctive turrets is the 17th century Watergate and to the east is the Heritage Centre built in 1992. Marble Arch Caves in Fermanagh Ireland are one of Europe’s finest show caves allowing visitors to explore a fascinating, natural underworld of rivers, waterfalls, winding passages and lofty chambers. It is advisable to check if the Marble Arch caves are open, as occasionally due to safety reasons, the caves are closed after heavy rain. The most important of Lough Erne’s many island church settlements, Devenish Island was founded in the sixth century by Saint Molaise. Admire the beautifully carved, intricate details including a ruined Augustinian abbey with figures and sculptures and climb the round tower. The round tower at Devenish Island stands at 30 metres (100ft) tall – internal ladders inside the tower mean the visitor can climb to the top and marvel at the spectacular views. 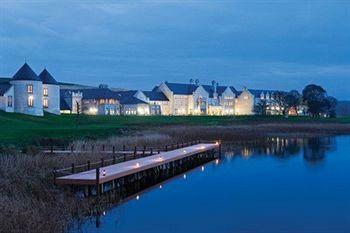 Lough Erne Golf Resort established in 2007 with a stunning location and beautiful golf course on the banks of Lough Erne. Lough Erne Resort hosted the G8 Nations summit on 17-18 June 2013 when President Obama and world leaders visited County Fermanagh in northern Ireland. Fermanagh Gaa has the smallest number of clubs of any county in Ireland, and is the only county in Ulster to have never won the Ulster Senior Football Championship. Despite this there is a strong GAA tradition in the county, which went largely unrewarded until the remarkable achievement of the 2004 team in reaching the All Ireland semi-final and forcing the match to a replay. Fermanagh Gaa went to that replayed semi-final in 2004 by beating Meath, Cork and Donegal and most memorably of all Armagh, thanks to a late point by Tom Brewster, before losing to Mayo. Enniskillen Airport is located just three miles North of Enniskillen town, on the shores of Lough Erne, Co. Fermanagh. It has been in existence for over sixty years (since the Second World War) and is one of only five licensed airports in Northern Ireland. It has a unique location adjacent to the Fermanagh Lakes and also encourages amphibious planes to the airport with a resident Amphibious Flying School based at the airport, which is quite unique in Ireland. They can also offer helicopter Pleasure flights and Hot Air Balloon flights around the beautiful landscapes of Fermanagh which also makes Enniskillen Airport a top attraction for tourists and visitors to the area.